Media organisations and news outlets have been adapting their production strategies and output to fit the needs of millennials, a term widely used to refer to 18-35-year-olds, a generation that tends to heavily consume and share content on the internet. Joe Harland, head of visual radio for the BBC, explained at a Westminster Media Forum event in November how Radio 1 aims to ensure it integrates online video alongside its radio output in a bid to engage with the younger generation. "We don't try and make telly or adverts for radio programmes – we try to identify those bits of a radio programme that are so fine, you want to see and share them," said Harland, speaking to Journalism.co.uk for a recent podcast. 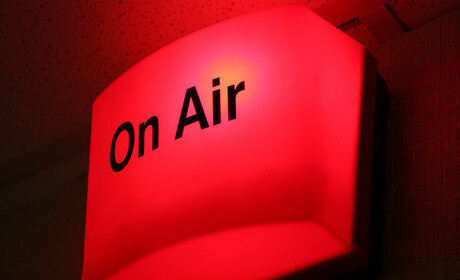 Platforms such as YouTube and Twitter have helped BBC Radio 1 connect with its target audience of 15-24 year olds. "You have to fish where fish are," said Harland. "You can have a great website [and] you can have great content on that great website, but if that is not where the audience naturally go, then you're not going to get the reach with the content that you want." This is one of the main reasons the BBC uses YouTube, he explained, alongside the fact that YouTube data is powerful enough to allow editors to see who they are targeting, when viewers are watching, and for how long they are watching. Harland also highlighted the dramatic change in attention span among online audiences, and the need for a quicker turnaround of material. "The younger audience have made it abundantly clear how long their attention span is. You can see how quickly you have to get content out there and react to a big news story," said Harland. "When Gangnam Style came out three years ago, you had about a month to do a spoof version of that. Harlem Shake comes out, that meme was over in about a week – and now you've got pretty much 24 hours to react to a story." By tracking what the audience is interested in through monitoring comments and feedback, the broadcaster can try to stay relevant to younger audiences. "It is [about] ensuring you never think that you know it all, accepting that you don't, and accepting that there is a 15-year-old out there who can tell you a great deal more about what a 15-year-old likes than you would know," Harland said. Through snappy content such as highlights of radio interviews or mash-up videos, BBC Radio 1 aims to produce 'a trail of breadcrumbs' from entertaining footage that will lead to their radio station. 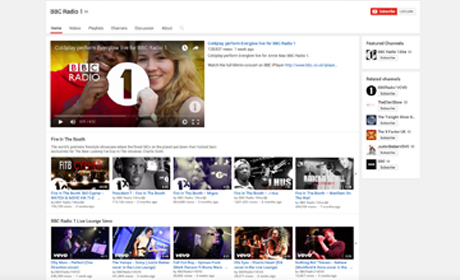 Screenshot of the BBC Radio 1 YouTube channel. "You are asking people to do quite an extraordinary thing, which is to watch a video and then listen to the radio. "What you don't want to do [as a radio broadcaster] is say 'hey, we made a video, go and watch that now', because you are sending them away from the radio to a platform of infinite entertainment," said Harland. "You have to be very careful not to just make adverts or orphan content – something that could be hugely virally successful but isn't in any way related to the radio show that you are making." Instead, people are given the opportunity to go to the BBC's iPlayer after they have watched short clips online. However, Harland said there has to be a compromise on quality in order to ensure they are able to produce so many of these bite-sized 'breadcrumb' pieces of content. "[Sometimes] you have to compromise an element of the visual for the quality of the audio and vice versa – striking that balance is important." Listen below for more from BBC's Joe Harland and other speakers from the Westminster Media Forum on how they are engaging with young audiences.